The countdown is on. Christmas is in just a few days! Imagine looking forward to a nice, quiet evening of enjoying the new book you received for Christmas. Cozying up by the fireplace sounds great, after all the forecast is for snow! While you’ve been busy unwrapping presents, socializing with family and friends and getting the holiday dinner together, your dog has been patiently lounging around. So, just as you are ready to sit down to relax, he bounces up, ready to play. It’s been a long day and he’s ready to go! Throw on that jacket and bundle up. Your pup deserves to frolic in the snow, at least for a bit. After a frigid frolic, you head inside and reach for your book. But first you reach inside the freezer and grab the last present of the day…a stuffed, frozen holiday treat for your pup. You’ll enjoy the peace and quiet it brings you and your dog will be ecstatic to have a delicious treat. 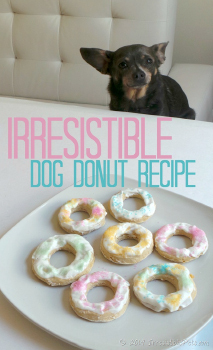 Struttin Pup has a free e-book of delicious recipes to stuff a Kong or Soda Pup toy. You can grab your copy here. 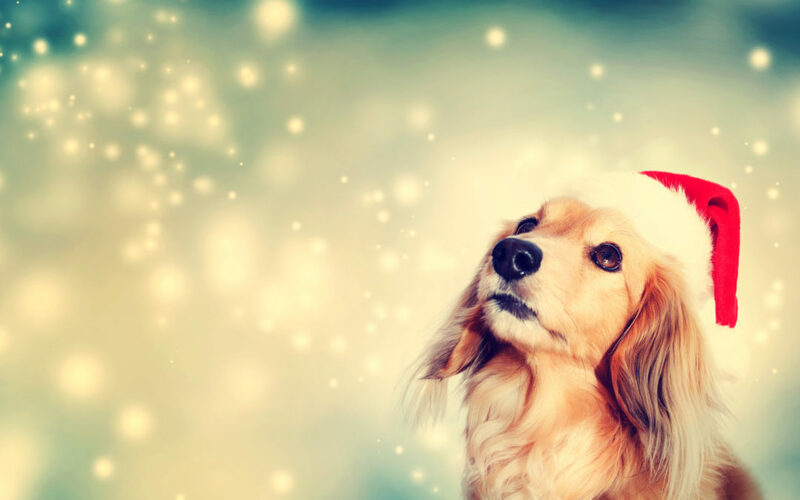 As our holiday present to you, here are some bonus festive recipes that your dog will dig (and some will make you drool too!). Have a wonderful holiday! OR, instead of stuffing your Soda Pup or Kong, place mixture in a shallow dish, sprinkle with dehydrated pumpkin, top with cinnamon, freeze and break into pieces of bark. 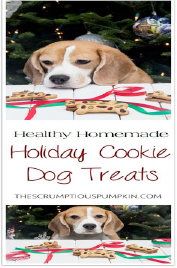 This makes a great holiday treat for your pup as well as his neighborhood friends. You can use the following directions to stuff a Soda Pup or Kong OR you can use a fun shaped ice-cube tray and show off your culinary art! Place dried cranberries, mint leaves and blueberries in the bottom of your tray to create a holly berry. If you are using a stuffable toy instead of an ice-cube tray, just mix all ingredients together and stuff…your pup doesn’t care what it looks like! Add a spear of carrot or sweet potato as your popsicle stick. Yes, Struttin Pup sells biscuits. We carry a lot of biscuits. A lot. But this time of year is, for some, the only time that the rolling pin comes out of the drawer. So, this year, while you’re making up a batch of holiday cookies for humans, how about baking some for your favorite dog or dog lover on your list? 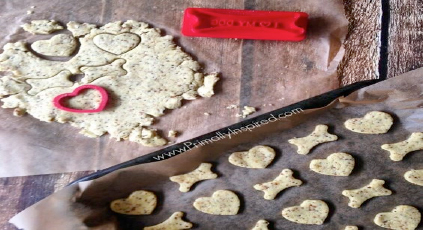 We’ve put together a roundup of some of our favorite, natural dog biscuit recipes for you to make this holiday season! An adorable beagle and a natural, festive biscuit. Who could ask for anything more? 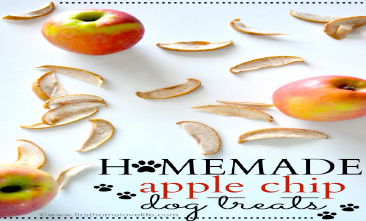 Here’s a treat that you and your dog can share! It doesn’t get simpler than this. This time of year, we all tend to indulge a bit too much. Dogs are no exception. 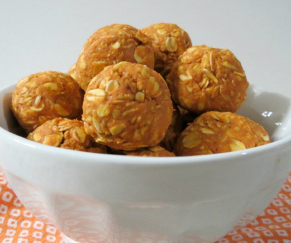 These treats include tummy soothing pumpkin to help ease the holiday indigestion! We LOVE coconut oil and so do our dogs! Add some peanut butter and you’re bound to have some happy pups this holiday. Fleas aren’t usually a big deal here in Colorado, nor are they a problem this time of year. 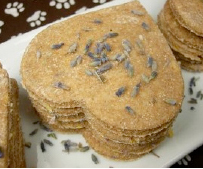 But these grain-free biscuits have the added bonus of keeping your pup flea free PLUS they help reduce bad breath! How cute are these? Make them more seasonal by using red, green or blue dyes. 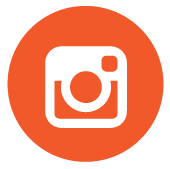 We would also recommend using Color Garden Pure Natural Food Colors in lieu of artificial food dyes. This recipe is perfect for anxious dogs this time of year. Now we just need a human version! 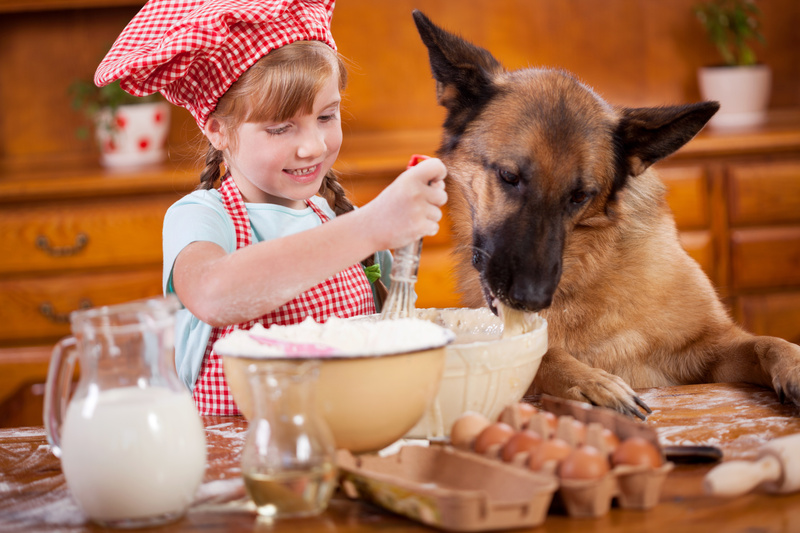 You’ll find a million gluten free holiday cookie recipes for humans but gluten free dog recipes are a little bit harder to find. Here’s a great one that would make a beautiful gift. Halloween can be so much fun. But put yourself in your pet’s shoes. The day is winding down and instead of snuggling with your favorite human, the doorbell keeps ringing. And ringing. And ringing. And your human keeps opening the door and strange little people, dressed in scary costumes are shouting something that sounds like “Trick or Treat”. You don’t know what’s going on, but you do know that this is no ordinary night. We’ve got some tips to make Halloween a little easier, safer and hopefully more fun for everyone! Candy isn’t good for you, but it REALLY isn’t good for your pet! Let’s start with the obvious. Chocolate can be dangerous, and even lethal, for cats and dogs. Xylitol can be poisonous as well. Vomiting, diarrhea, increased heart rate, seizures and rapid breathing are all symptoms of chocolate poisoning. Even the smallest amount of xylitol can cause a rapid drop in sugar and a loss of coordination and seizures. Make sure to keep the candy out of reach of all pets – even those that can counter surf and open cupboards. Keep your dog away from the front door. Whether you use a baby gate or tether your dog to you, make sure your dog can’t dash out the door when Trick-or-Treater’s come knockin’. If you have an anxious or territorial dog, it’s best to use a baby gate, crate them or keep them in a closed off room that they are comfortable in. As for cats, keep them in a closed off room that they feel safe and secure in. And make sure everyone is wearing their ID Tags, just in case they do make a run for it. 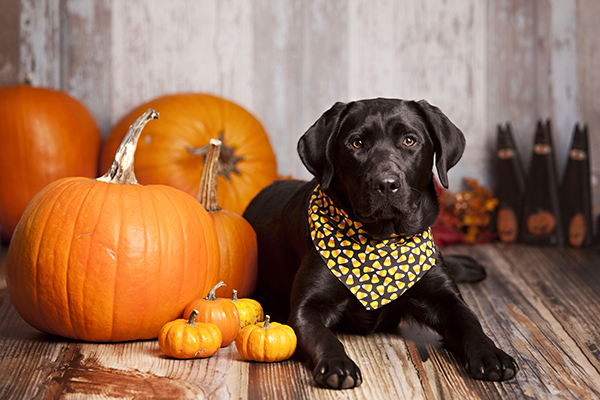 Keep your pets inside – even in the days leading up to Halloween. It seems incomprehensible to us animal lovers that this could happen, but vicious pranks involving teasing, stealing, injuring and even killing animals are known to come around during Halloween. Black cats are especially at risk. Did you know that some animal shelters won’t even adopt black cats out in October due to safety risks? It’s best to keep everyone inside, safe and sound. Pumpkin is great, but too much pumpkin is not! Pumpkin is wonderful for pets. 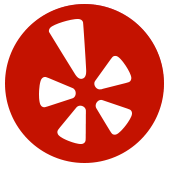 It’s so wonderful we wrote a blog about it! But think how you would feel if you at an entire pumpkin! 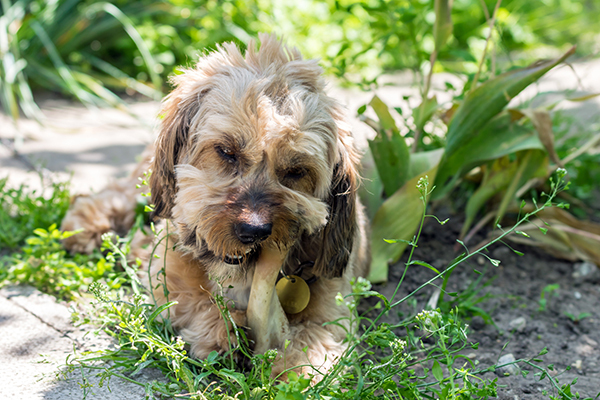 Besides a horrible tummy ache, intestinal blockage can occur if larger pieces are ingested. Keep an eye on other fall foods, such as Decorative Indian Corn, which can also cause intestinal blockage if eaten. Jack-O’-Lantern’s and Pets Don’t Mix. Keep the lit jack-o’-lantern’s outside and away from any pets. Pets can easily get excited, bump into them, and cause a fire or get burned. Try lighting your jack-o’-lantern with Pumpkin Lights or Glow Sticks and avoid fire danger altogether. You may have a pet who loves playing dress up. But for every pet who loves it, there are 10 who hate it. Try out your pet’s costume a few day’s in advance of Halloween. If they seem to be comfortable, great! If not, try something smaller, like a Halloween Bandana. Here at Struttin Pup we are more than just a pet store. 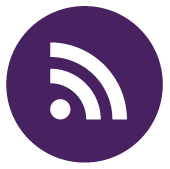 We build community by providing fun and informative events. 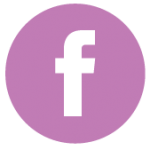 These events are a great opportunity for humans and fur babies to socialize. Some dogs are cool as a cucumber around other dogs and people. Other dogs are shy, fearful, aggressive or hyper when around other dogs and people. 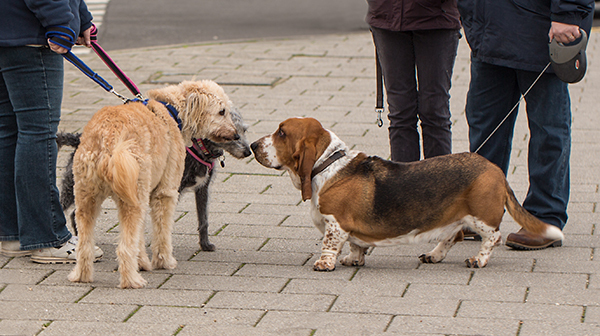 Whether you have a social butterfly or a wallflower, we have put together some helpful tips that will help ensure that everyone has a great time, most especially your dog! 1. Always ask the owner if it is ok for you and your dog to interact with their dog before meeting. 2. Remain Calm. Your dog can sense your anxiety through your body language. Keep your dog’s leash loose. Sometimes tension on the leash will communicate to your dog that you are nervous and will, in turn, make them nervous. 3. Have some high value treats (Struttin Pup will always have plenty of treats for you at our events) that can distract your dog’s attention back to YOU. Treat your dog often for remaining calm and focused on you. 4. Pay attention to body language. If your dog (or the dog you are meeting) stiffens their bodies, stares into the other dog’s eyes with their hair raised and teeth bared or lunges (even in excitement), put some space between them and give them time to calm and get used to each other from afar. 5. Don’t feel guilty if your dog isn’t a social butterfly. Your dog doesn’t need to be the life of the party, but he does need to BE social and NOT aggressive with other dogs. Keep a close eye on your dog and always keep him on leash. If you think that he’s starting to feel overwhelmed, it’s best to be a wallflower and take a break from the action! Though our pools won’t be much more than ankle deep, our upcoming Pool Party on Saturday, August 27th got me thinking about dogs and swimming. I have a Golden Retriever that won’t swim. She obviously never got the memo that she’s a water dog. Though we assume dogs are natural born swimmers, not all breeds (or all dogs, even if they are “water dogs”) are. Some breeds can’t swim at all and will sink without a floatation device. It’s a great idea to introduce your dog to water when it’s a puppy. But, regardless of age, these steps below will help get your dog swimming in no time (or at least they’ll be more comfortable with water!). Some dogs may take to swimming quickly, but if yours doesn’t, don’t worry. These steps can be done over a period of several days so they don’t get overwhelmed. 1. NEVER throw your dog into the water for her first swim. This will only ensure that she’ll never want to swim again. 2. Start somewhere quiet and shallow so that you can walk in the water beside your dog. 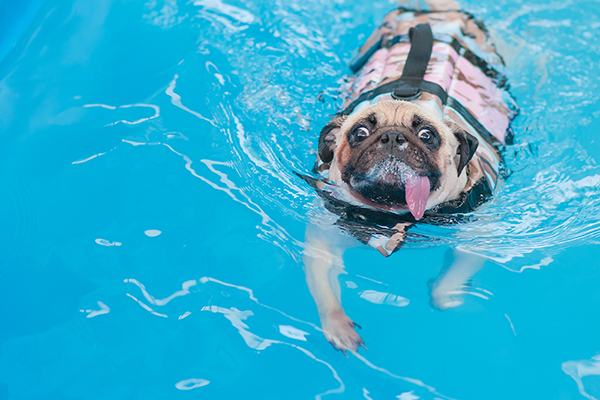 Keep your dog leashed until they are able to swim unassisted and consistently come back to you when called. If needed, have them wear a life vest (especially if they are one of the breeds listed above). Let them get used to getting their feet wet. You know how shocking it can be when your toes hit cold water initially. It takes time for your dog to get used to it too! 3. Bring some favorite toys or treats to help coax her farther into the water. 4. This next step can be tough with Colorado’s cold water temperatures, even in the summertime. But using lots of verbal praise, take her deeper into the water until she has to start paddling to stay afloat. If she needs a little extra support, put your arm under her belly. This will help her use her rear legs along with her front legs. She’ll tire more easily if she is only using her front legs to swim. Support her until she is using all four legs to swim. 5. If your dog starts to panic, go back to shallow water, calm down and try again!